American University Park or AU Park is a quiet, low-key neighborhood located in the Northwest quadrant of Washington, D.C. Despite its name and proximity to American University, few of the University's buildings are actually located in AU Park. 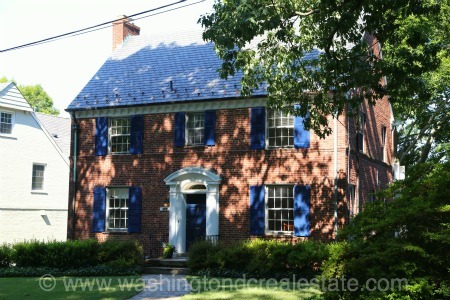 The area is one of the few DC neighborhoods that has a suburban feel yet is located within the District's boundaries. The tree-lined streets serve as a backdrop for the 2700 single-family homes, many featuring colonial-style architecture and well-manicured lawns. A favorite "large green" gathering spot is Turtle Park. Read more about AU Park real estate. Known for its top-ranked schools, all of which have recently undergone major renovations, the area is home to young families and senior citizens. Residents also have easy access to a cluster of shopping and eating options within walking distance along Wisconsin Avenue. Residents looking for more sophisticated dining options can head North to Friendship Heights. The community is anchored by two metro stops on the Red line -- Friendship Heights and the Tenleytown-AU stations. AU Park is also the site of the Cityline at Tenley condo development. Located West of Tenleytown, AU Park is bounded by Western Avenue to the northwest, Massachusetts Avenue to the southwest, Wisconsin Avenue to the northeast and Nebraska Avenue to the southeast. Is Washington DC Home to Any Arboretums?